Redfish are the staple of our inshore fishery in the Indian River, Banana River, and Mosquito Lagoon. Thirty minutes east of Orlando, Florida, and just north of Cocoa Beach, these three bodies of water surround the Kennedy Space Center complex. They are part of the Canaveral National Seashore and Merritt Island National Wildlife Refuge. This unique area of Florida is the most diverse saltwater estuary in the United States. We are fortunate to have an excellent nursery area for juvenile reds as well as abundant habitat for adult fish. Redfish are extremely wary when feeding in shallow water, but can be caught on a variety of properly presented live baits, dead baits, and artificial lures all year long. The preferred method of fishing for this species is to “site cast’ to single “cruising” or “tailing” fish. Because you are looking for fish prior to making a cast, it is extremely important to wear polarized glasses which enable you to see these fish more clearly in the water. Calm periods make this process much easier because the fish are more visible as they feed in the shallow lagoon waters. During portions of the year redfish form into schools that can number into the hundreds. When this occurs, these fish become much more aggressive and easier to catch. Six to twelve pound class spinning and casting equipment are the most popular tools for catching redfish. Fly fisherman will be best suited with 6 to 9 weight gear. Redfish can be caught all year long in East Central Florida. But some months of the year are better than others. Slot sized fish are usually most abundant in the months of April, May, June, August, September, and October. They are also very aggressive during warming trends between cold fronts in December through February. The larger adult fish are protected from harvest. These fish are a unique genetic strain that has adapted to life in these estuaries. These giant fish even spawn inside our lagoon system instead of out at sea. This phenomenon isn’t known to occur anywhere else in the redfish’s range from Maryland to Texas. The spawning ritual usually occurs from mid August to mid October. During this time of the year you can expect to see 400 to 1000 fish in each school. These aggressive 15 to 40 pound (35 to 50+ inch long) fish will devour everything that hits the water in their path. This is the hottest “big redfish” action you will ever experience in your life. The waters of the Indian River, Banana River, and Mosquito Lagoon are home to some of the largest Speckled Trout found anywhere in the US. They are unquestionably the most popular game fish in the state. 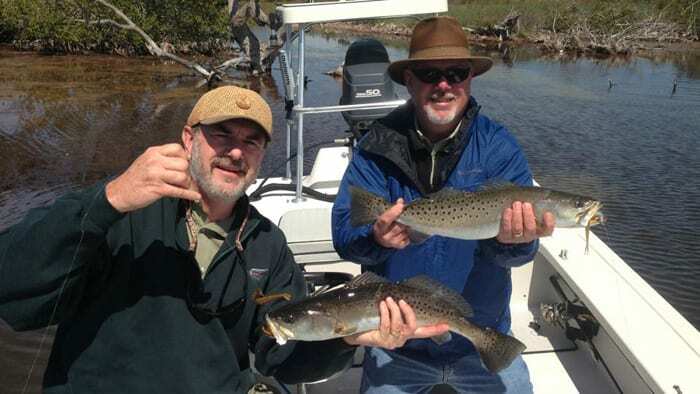 East Central Florida was once known as the “Speckled Trout capital of the world”. Conservation efforts over the last ten years are helping this once over-harvested species regain its former popularity. Giant specimens known as “gators” well in excess of 8 pounds are becoming more common every year and the numbers of three to eight pound fish we are catching in the spring and fall months are tell tale signs that this highly prized species is rebounding wonderfully. Juvenile trout (10 to 14 inches) are excellent targets for young and inexperienced anglers on light tackle. These fish usually feed aggressively on small minnow or shrimp imitations throughout the day and simultaneous hookups are a common occurrence when a school of trout is encountered. This is an excellent species for beginning and intermediate fly anglers to target as well. Six and eight pound class spinning outfits are the most popular type of gear to use for trout. Fly fisherman usually prefer 5 to 7 weight gear. A variety of live and artificial offering will tempt speckled trout, but it’s hard to beat a top water plug. Trout crash these with reckless abandon, often jumping completely out of the water to pursue these lures. Small speckled trout can be targeted throughout the year. Anglers can easily catch double digit numbers when a good sized school is encountered. The best months for the larger “gator” sized trout are October through May. Especially between cold fronts during December, January, and February and also preceding the “new” and “full” moon phases in March, April, and May. Tarpon are a “seasonal” species that add variety to the types of fish we encounter throughout the year in our lagoons and near shore Atlantic Ocean waters. They are usually available during the warmer months of the year (April through November) when our water temperatures remain above the 80 degree mark. Juvenile tarpon weighing from 2 to about 50 pounds inhabit our lagoons and backwater creeks during most of the year. 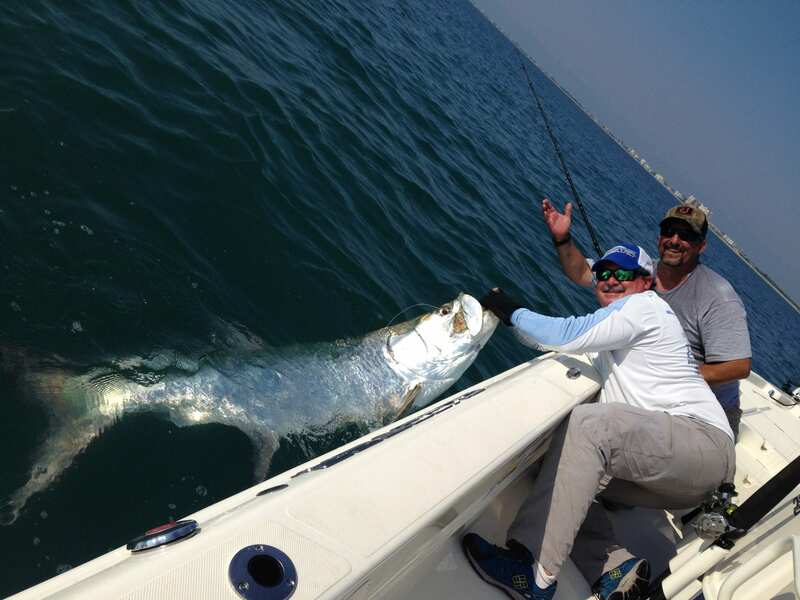 They are the most acrobatic and hardest fighting fish we target along Florida’s “Space Coast.” Larger fish averaging 75 to 120 pounds travel in schools along our beaches following schools of baitfish. June, July, and August are usually our best months for these larger specimens which can grow to over 150 pounds. Baby tarpon love to eat small jigs and flies that imitate glass minnows or small pilchards. Spinning rods loaded with 8 to 12-pound test lines are the preferred tackle for these smaller fish as are fly rods in the 6 to 8 weight range. When chasing fish over 50 pounds we’ll use spinning or casting gear in the 15 to 30 pound class range. This larger gear is necessary when anglers are trying to land fish that are large enough to pull the boat around. Large baitfish such as menhaden, mullet, or pinfish in the 6 to 14 inch range are generally slow trolled or drifted through the schools of tarpon once we find them. Snook can be found in all of the salt and brackish waters in Central Florida. The three smaller species (swordspine, fat, and tarpon) and many of the small “common” snook prefer to hide in backwater creeks and canals throughout the Indian and Banana River lagoons from Sebastian northward to Oak Hill. Larger “common” snook tend to gravitate toward the inlets and beaches near Cape Canaveral and Sebastian. 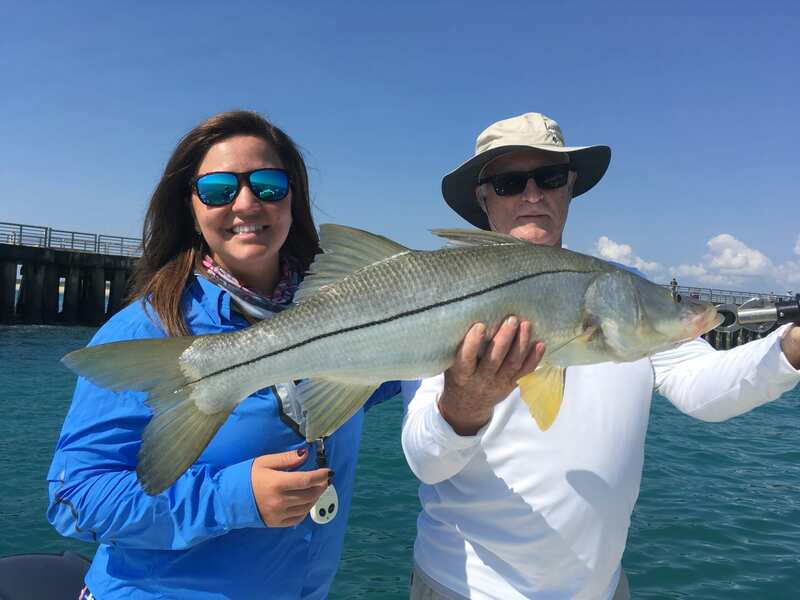 The most exciting time of the year to fish for snook is during the “Fall Mullet Run” that occurs along our Atlantic Coast beaches starting in late August. Millions of these small baitfish migrate southward at this time of the year and the snook are right on their tails feeding with reckless abandon. When the snook group up to attack the mullet schools It is one of the most visual feeding frenzies that you will ever experience, and almost every cast is met with a arm jarring strike. 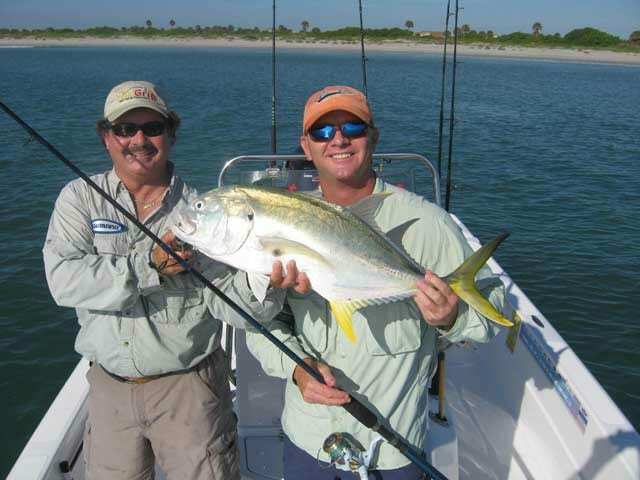 This baitfish migration is usually over by mid November, at that time the snook fishing slows down considerably. Smaller snook (15 to 22 inches) are excellent targets for spin and fly fisherman using light tackle. These fish usually feed aggressively on small minnow or shrimp imitations throughout the morning and evening periods. This is an excellent species for beginning and intermediate fly anglers to target as well and fly fisherman often will out fish anglers using artificial or live offerings. Eight to twelve pound class spinning outfits are the most popular type of gear to use for small snook. Fly fisherman usually prefer 5 to 7 weight gear. A variety of live and artificial offering will tempt snook, but it’s hard to beat a small top water plug or popping bug during early morning periods. Snook smash these with reckless abandon, often jumping completely out of the water to pursue these lures. Larger specimens (24 to 40 inches) usually hang around docks, piers and rock jetties where 15 to 30 pound class tackle is usually needed. Snook in the 10 to 20 pound range eat much larger baits and lures such as pinfish, 8 to 12 inch mullet, croakers, and large lipped diving plugs or 1/2 to 1 ounce jigs. Black drum are generally a “seasonal” fish that we rely on to add a little spice to our winter time fishery. Due to enhanced regulations on this species, we are seeing an increase in the number of slot sized fish we are catching over the past few years. Now decent numbers of these hard fighting fish are usually available throughout the year on the shallow flats in the Indian River and Mosquito Lagoons. The Winter months from December through March tend to be best for this species because they prefer when water temperatures range from about 50 to 75 degrees. During these colder months we generally find large schools grouping together, many of which have 250 to 500 fish in them. Black drum ranging from 1 to 10 pounds also inhabit the residential canals and creeks throughout the Merritt Island and Cocoa Beach area. They make great targets when the winds will not allow us to “sight” fish out on the open flats. On calm winter days we often get shots at larger black drum scaling from 20 to 60 pounds on the deeper flats of the Indian River. Spinning rods in the 6 to 10 pound class range are preferred when chasing slight slot sized drum in the open flats. Live shrimp, cut clam, and small pieces of crab are usually the best natural baits for black drum. They will hit soft plastic shrimp or jig tails enhanced with shrimp scent as well. Fly anglers love chasing these “usually” cooperative fish because they “tail” aggressively and readily eat small dark colored flies that imitate shrimp and small crabs. Once hooked they often take the entire fly line and a considerable amount of backing when anglers target them using 5 to 7 weight gear. Cobia are found only in the waters of the Atlantic Ocean in this portion of Florida They are generally present anytime the water temperature readings are above the 68 degree mark. We generally have a “Spring” (Feb-March) and a “Fall” (Oct-December) run of these incredibly hard fighting yet good tasting fish. Cobia are found around the Canaveral shipping channel buoys and near shore wrecks. They can also be found near color changes, temperature changes, all sorts of floating weeds or flotsam. They are also very cunning hunters and will follow large sea turtles and manta rays using them like mobile ambush stations when ever possible. Cobia are curious animals and will often swim right up to the boat to see “what’s going on.” During the Spring of the year we search for them on sunny daysas they come to the surface to bask in the sun for warmth. “Sight” fishing for them is one of our favorite ways to pass a warm spring time day. 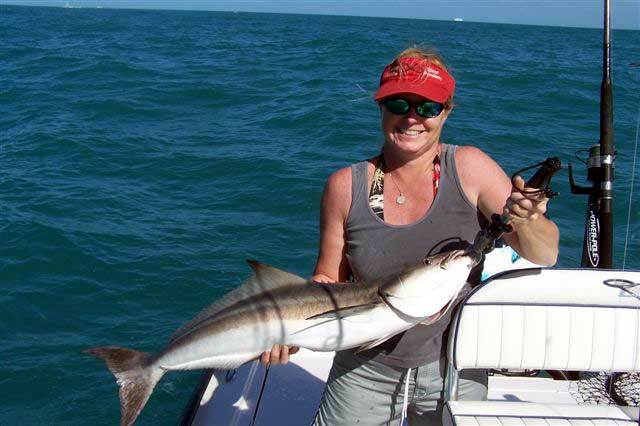 Tackle for cobia usually consists of 15 to 30 pound class casting or spinning gear. Large top water plugs, spoons, and bucktail or nylon jigs ranging from 3/4 to 2 ounces are great lure choices for these fish. Live menhaden, mullet, pinfish or crab are preferred natural bait choices. We generally do not use circle hooks when fishing for cobia as they have an uncanny knack of spitting these types of hooks. Fly fisherman need to use 9 to 11 weight gear to cast the large streamer flies the cobia usually like to eat. Crevalle Jack are closely related to Pompano, Permit, Amberjack and other edible fishes, but they have ZERO food value. In my opinion, these fish are pound for pound the best fighting fish that swims in any water anywhere in the world. Period! Crevalle have voracious appetites and will usually hit any moving object if they think it won’t eat them first. Whether you use spin, plug, or fly tackle for jack you will experience a fight like nothing you’ve ever experienced before. From hook-up to boat-side release these popular fish will pull non-stop. Smaller fish to 8 pounds are available throughout the year in all three lagoons. Larger fish ranging from 10 to 35 pounds are usually most abundant from late March through early October. Their spawning period of May through July is unquestionably the best. Gear ranging in size from 8 to 30-pound class is used most. You just need to decide how much punishment you want to endure before choosing a rod and reel combo to chase them with. 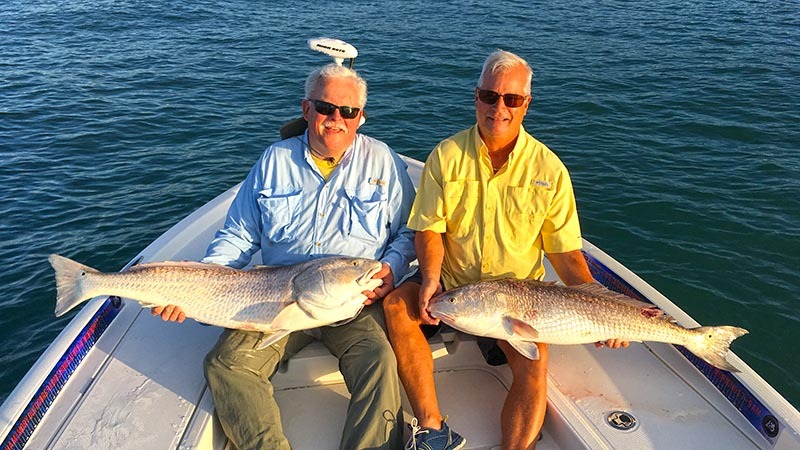 The smaller fish encountered inshore fight best on 8 to 15-pound class gear and the larger ocean runners are best with 15-pound class gear and above. 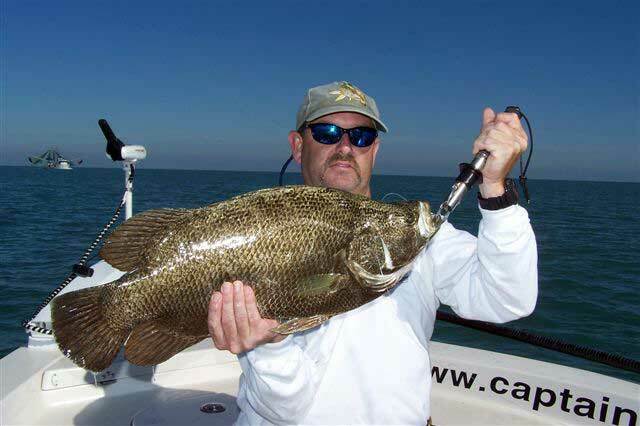 Tripletail are another “seasonal” fish that are extremely under estimated fish when it come to shear pulling power. They are often spotted laying motionless on the waters surface. When presented with a bait they often take their time trying to eat it. Once hooked, these fish transform into serious drag stripping machines. Because of their “three” tails they can generate an enormous amount of force. This surprises many anglers, especially when we’re fishing for them near channel markers. Larger fish often can’t be stopped and anglers end up losing them once their line is parted by the channel marker’s chain. Fortunately fish that do break off have short memories and we find that they will usually eat again at some point later on in the day. 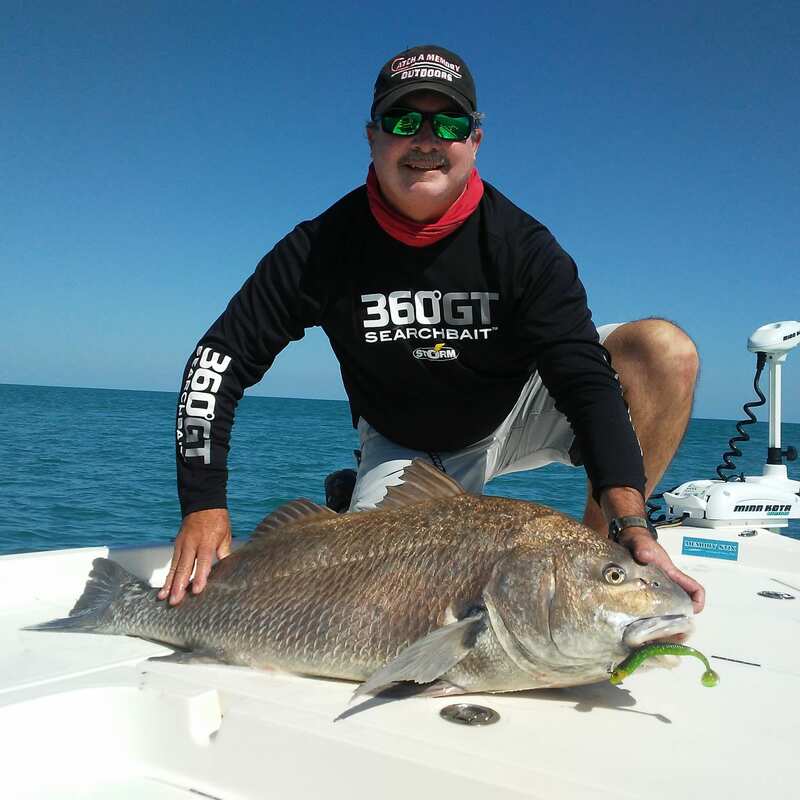 Because we fish for tripletail in close proximity to underwater hazard 20 to 30 pound class gear is necessary when targeting the larger fish in the 10 to 25 pound range. Smaller fish or fish that are found “floating” or “free swimming” out in open waters can be taken on much lighter spinning, casting and fly tackle. Fish of less than 8 pounds usually hit small live baitfish or shrimp, larger fish will strike live baits such as menhaden, mullet, sardines, pilchards, pinfish or croaker. Many of the International Game Fish Association (IGFA) world records for tripletail have been either caught or broken right here at Canaveral (including the one I used to hold for 8 pound class fly tippet) so you never know when you might get the shot at a true “world class fish”. There are various other hard fighting species of fish that can be targeted throughout the year along the near-shore waters of the Atlantic Ocean. 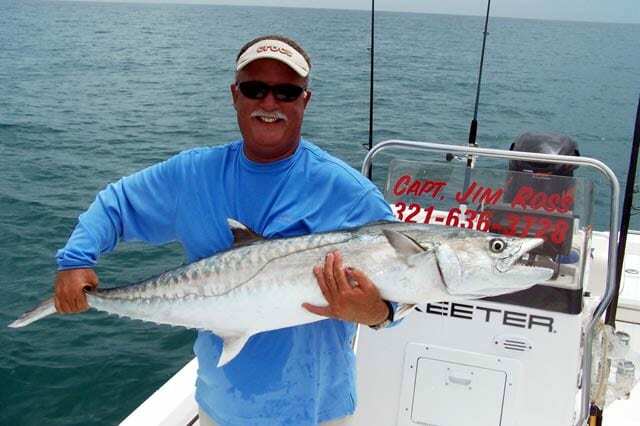 They include multiple types of shark, bonito, spanish mackerel, barracuda, snapper, flounder and more. These are all fun fish to catch, but are “seasonal species” along our East central Florida coastline.